People hold Korean Unification Flags during a pro-unification rally ahead of the upcoming summit between North and South Korea in Seoul, Apr. 26, 2018. The signs read, "Welcome inter-Korean summit" (L) and "Peaceful spring for our people" (R). China is intently watching this week’s historic meeting between North and South Korea, hopeful that crucial steps will be taken towards peace on the Korean peninsula, but also anxious, analysts say, about the role it can play as talks move forward. The direct talks on Friday and an expected summit between U.S. President Donald Trump and the North’s Kim Jong Un on a future date have raised the prospect for peace. But it has also meant that Beijing has had to take a step back and watch a key regional security and geopolitical issue develop from a distance. 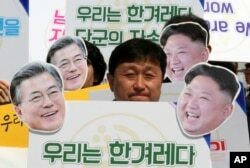 An activist with cutouts of South Korean President Moon Jae-in, left, and North Korean leader Kim Jong Un participates in a rally welcoming the planned summit between South and North Korea in Seoul, South Korea, Apr. 25, 2018. Lu Chao, a North Korea expert at Liaoning Academy of Social Sciences, said China is hopeful about the prospect of the North and South creating more stability on the peninsula. “We are also worried because North and South Korea have been at odds with one another for more than half a century and that has led to some huge contradictions, which cannot be resolved in just one meeting,” Lu said. Professor Steve Tsang, director of the China Institute at London’s School of Oriental and African Studies, said China hopes Friday’s meeting will pave the way toward a successful summit for President Trump and Kim. He added Beijing will be looking for ways that it can keep playing a pivotal role in the peninsula’s affairs. 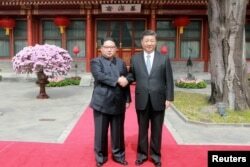 FILE - North Korean leader Kim Jong Un shakes hands with Chinese President Xi Jinping in Beijing, as he paid an unofficial visit to China, in this undated photo released by North Korea's Korean Central News Agency in Pyongyang, March 28, 2018. To make sure that does not happen, Beijing reinserted itself last month into the dramatic shift of events on the peninsula by taking the unprecedented step to secure a meeting with Kim Jong Un, his first visit to China since coming to office. Analysts said President Xi is expected to visit North Korea this summer after Kim meets with Trump. To keep itself more directly involved in the process, China is pressing for the Trump-Kim meeting to be held in the capital of Beijing, but few analysts think that is likely to happen. State media and China’s Foreign Ministry have repeatedly noted the important role Beijing has played on the peninsula and that it should continue to play. China’s military backed North Korea against South Korea and U.S-led United Nations’ forces during the Korean War. Beijing was one of the signatories of an armistice agreement that ended broader hostilities but that did not result in a peace agreement. In a recent article in the Chinese language version of the Financial Times, Liu Ming, a senior researcher at the Shanghai Academy of Social Sciences’ Institute of International Relations, argued that Trump needs to acknowledge China’s importance. If he doesn’t, Liu said, Washington’s position in the negotiations would be weakened. He also said cooperation and support from third-party stakeholders is necessary for the meeting to produce results. But such an arrangement would be similar to the six-party talks, a grouping of six-nations that previously tried but failed to keep Pyongyang from developing nuclear weapons. The Trump administration has shown little interest in following old approaches and has also said it will not weaken sanctions or reduce its “maximum pressure” until significant progress is made toward denuclearization. Beijing, however, is pressing Washington to not only give North Korea security assurances but to ease off on sanctions as well in response to the North’s recent pledges to halt nuclear and missile tests. However, how soon anything could happen is uncertain. What is clear is that things are changing rapidly now. Tsang notes that it wasn’t long ago that President Trump was describing Kim Jong Un as a “rocket man” on a suicide mission. 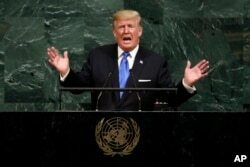 FILE - In this Sept. 19, 2017 file photo, U.S. President Donald Trump addresses the 72nd session of the United Nations General Assembly, at U.N. headquarters.